Christian from Thinktecture prepared a list of new features and improvements that are part of the Orcas release of WCF. My favorite one is Custom username over transport security. The reason is that I've been trying to integrate WCF and PHP in a secure, standards based way and I've learnt that it's not easy because Custom username in WCF 1.0 forces you to use a mix of transport and message security (TransportWithMessageCredential). As we all know support of WS-* specifications in PHP world is far less than perfect and going directly to the transport security might make my life easier. I will write about my PHP/WCF/Java story later on. 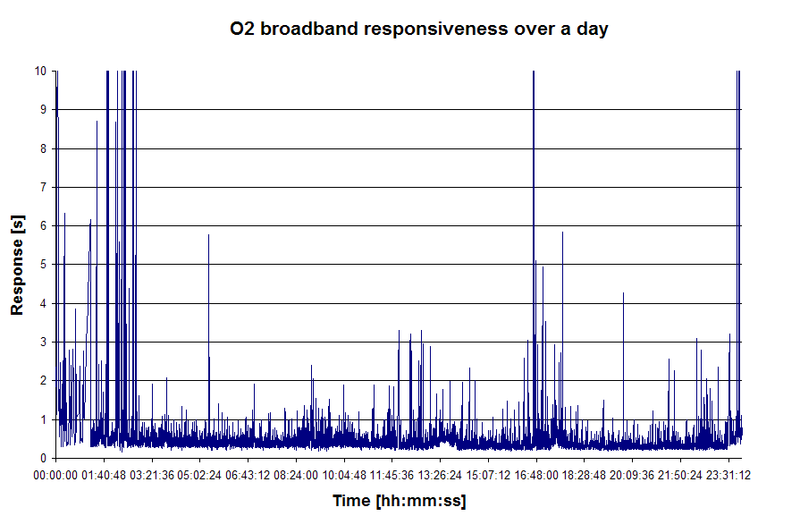 Quite a few people asked my to describe my O2 broadband user experience. Sure. 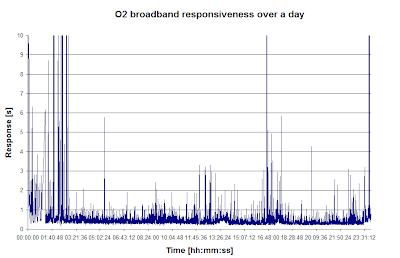 I've been using O2 broadband for a month and I'm happy enough and I can not really complain about it though it's not perfect. Let me provide some data that I gathered using a small app I wrote. The test app was sending every 10 seconds a unique (to avoid caching) query to google and measured the response time. The first test was running for 24 hours in my house which is located in Dublin 14. 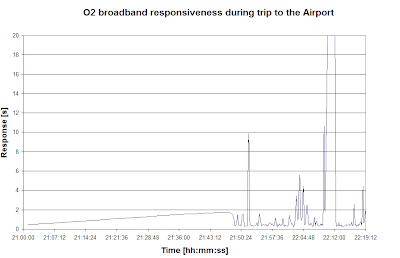 As you can see in most cases the response time was below 1 second though there ware a few periods when the response time exceeded 10, 15 or even 20 seconds. Fortunately, as I said there ware only a few of them and they lasted for around a minute. 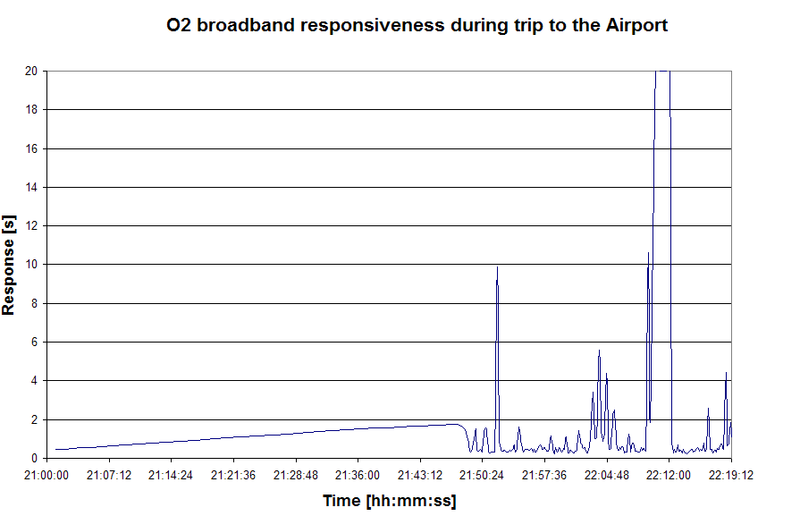 Next I checked how the response time is dependent on the location in Dublin. I got on the Aircoach in Sandyford and went with my laptop to the Dublin Airport. The exact route can be found here. During the trip I applied the same procedure as the one described before. The results are again decent but they could be better. need to be able to connect to the Internet in nearly any spot in Ireland. If 3G is not available it falls back to GPRS. as myself on the one hand don't appreciate how Eircom acts and try to avoid it but on the other hand need to have access to the Internet that works most of the time. Scott Guthrie doesn't stop surprising me. Nearly every month he publishes something that makes me think that Microsoft is not that bad at all :). Today topic is the .NET source code. One could say that Reflector provides that functionality since it came out. That's true but Microsoft goes beyond that and they actually integrate debugging symbols + source code with VS.NET 2008. This feature will let you seamlessly step into the .NET framework code while you debug your own application. What is more they provide code with all the comments which from time to time can make huge difference. Of course they don't go mad completely and the licence the code will be released under prevents you from copying it. No hope for a quick catch up for Mono :).